Postal scales are one of those pieces of equipment almost every office uses but which even most office workers simply don’t think about. Even today, if someone in my office needs to mail something they are more likely to guess the weight then to use the available postal scale. That’s unfortunate as a good postal scale will save your office (and you) money by ensuring you use only the amount of postage required. 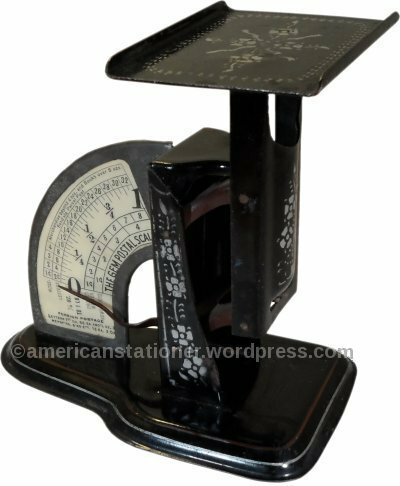 Our vintage item is the Gem Postal Scale manufactured by the Triner Scale and Manufacturing Company of Chicago, Illinois. Weighing only 6 ounces and measuring 4.5″ L x 2.875″ W (the weighting platform is the widest part) x 4.5″ H, the Gem Postal Scale was made from cold-rolled steel and enameled in a “japanned” finish. The one in my collection (shown in the picture above) also has a painted vine decoration in silvery-white on the front, sides, and on the weighting platform. Along with this design is some red and gold pinstriping. Many models of the Gem came in black but without additional adornment of any kind and later-made models could be found in basic grey enamel. The “basic black” design without additional decoration was available from the beginning of its manufacture until Triner stopped making it. Early on they made a combination Gem postal scale and ink well model that came in black and oxidized copper finishes. They made this same combination item using the other scales in this series also. These were available at least until 1919 and likely until the early 30’s and possibly later. There are no markings on the scale. No patent information, not even the name Triner. The only information to be found is on the paper label which displays the postal rates and weights and it simply states “THE GEM POSTAL SCALE”. This can present a problem when trying to date a scale. There is essentially only one method you can use in this case, and that is the postal rates given on the dial. For example, on the scale in the main picture above you’ll note that a letter cost 2 cents per ounce to send. Those rates would have been in effect from July 1, 1919 to July 5, 1932. Therefore, it would be reasonable to deduce that this scale was made in that time period. The Gem Postal Scale was patented. Patent 752874 was applied for on June 22, 1901 and granted on February 23, 1904 to James M. Triner. This patent, however, was never assigned to the Triner Scale and Manufacturing Co. Here is where it gets interesting. The above three patents were granted to James Triner but all three of them were assigned to the Pelouze Scale and Manufacturing Company. There is some strong circumstantial evidence that J.M. Triner got his start by working for Pelouze which had been around for at least 4 years (and probably a good deal longer) when Triner made his first patent application. Triner Scale and Manufacturing Co is still in business today and is a respected company that makes quality items. The Triner tagline is “Accurate Around the World since 1897”. Here I’m going to make a controversial statement; I don’t think Triner Scale and Manufacturing was around in 1897. Of course, I may be incorrect but I don’t think so. 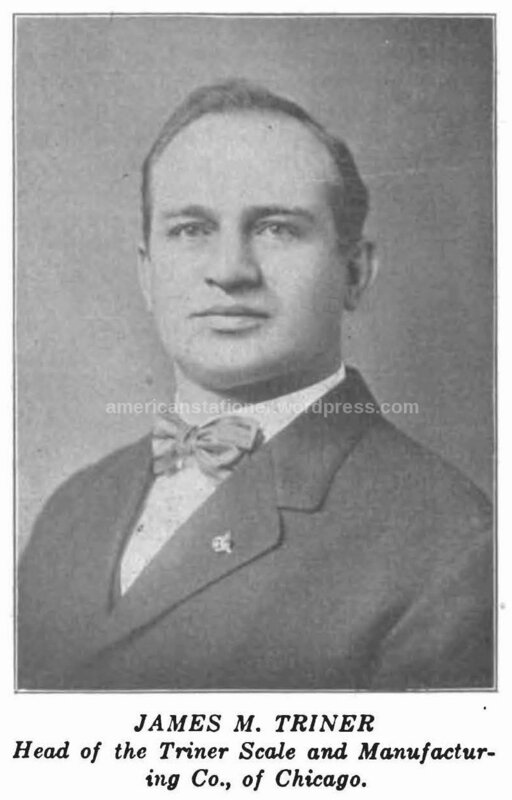 According to an April 17, 1913 article in Geyer’s Stationer which included a short interview with Mr. Triner, Triner Scale and Manufacturing was established in 1902. If the company wasn’t established until 1902 how could they be “accurate around the world since 1897”? Well, the short answer is this, James Triner had been making and designing scales from about that time. It’s just that he made them for Pelouze before starting his own company. Since the above may sound a bit harsh, let’s try to place this story in a bit of context. The Pelouze family by 1905 were considered very well-to-do and were listed in the Chicago Blue Book, the early version of “Who’s Who”. Mr. Triner on the other hand, was not. I would conjecture that Mr. Triner was very proud of his humbler beginnings and how he succeeded from very little to build one of the premier scale companies in the world. He was obviously a good engineer and a very good businessman. If later generations decided to use a bit of marketing to make the company seem just a bit older it’s understandable. I have catalogs showing the Gem being available for sale as late as 1943. It is likely they were available for a longer time but it’s impossible for me to gauge exactly how long. The Gem Postal Scale was sold from at least 1902 to 1913 for $1.25. Adjusted for inflation that $1.25 in 1913 would be approximately $30.00 in 2014. Made from pressed steel and with very few parts it would have been easy and inexpensive to produce. Its design assured accuracy (the one in my collection works just fine) and the simplicity of manufacture likely made it a very profitable item. It’s no wonder it was made for such a long time. Around 1908 Triner introuduced the Liberty Scales. These were of similar design and came in different capacities much like the Gem. It appears that for at least a few years they were in two locations on West 21st street. J.M. Triner also had at least two other patents that had nothing to do with scales. One was for a skirt hanger and the other was for a rotary valve for gas engines. If you have one of these scales and it isn’t showing the correct weights, you can adjust it. 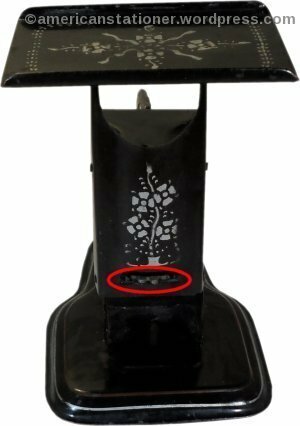 There is a cogged wheel in the front of the scale (circled in red in the picture above) which tightens and loosens the scale spring allowing you to adjust the scale for accuracy. These may be near-antiques, but they’re working antiques. There is no reason you couldn’t use it for its designed purpose today even if it is approaching 100 years old.